Let me start off with a disclaimer. I pretty much never use a processed or pre-made products. It’s just how I roll. I enjoy making everything from scratch I get a lot of slack for it, but I like it. What can I say? But in the midst of life lately with school starting back up, working, keeping our home going, and Brian fed, I needed to find ways to help shorten some meal making without sacrificing my eating style. I am a curry lover. You know how much I love all foods, so I won’t go into that. Curry is no less than the others I love. Green in my favorite. I enjoy making it from scratch from simple ingredients comes a flavorful and beautiful paste that makes any dish sing. But I honestly do not have the time for that right. At least if I want to keep my straight A streak in culinary school, I choose to study rather than make curry from scratch at the moment. I found a great compromise to save time but fulfill my large batch, curry deliciousness craving. However, I really would only use this brand. I did tons of research and Asian store shopping to come across this brand of paste. It has no preservatives, color added, or funky ingredients Which is my kind of food. The ingredients are: green chile, lemongrass, garlic, salt, galangal, shrimp paste, kaffir lime, coriander seed, pepper, cumin, tumeric. I did this all on my own, no one is paying me for this. These are my opinions and my research done all by myself. The brand I use is, Mae Ploy. They have several curry pastes, and I got it at my local Asian store. Where I usually stock up on my Asian ingredients that I keep on hand at all times. Asian stores are seriously everywhere in my area. They have great prices, and good produce. Give it a shot if you haven’t visited one. If you have question, feel free to ask me or the clerk at the store for the best brands. The brand of Coconut milk from above photo I always buy (full fat, never light), mirin, soy sauce, fish sauce, rice noodles, egg noodles, bok choy, Japanese eggplant, kaffir lime, Thai basil, chile pastes, and spices. Depending on my menu. Note: Easily make this a vegetarian dish by omitting the pork and add your favorite veggies. 1. In a large pot or Dutch oven add 1 tbsp of oil over medium heat. Add green curry paste and stir. Cook over medium low heat for at 5-7 minutes, stir occasionally as to not burn. This develops the best flavor for curry. 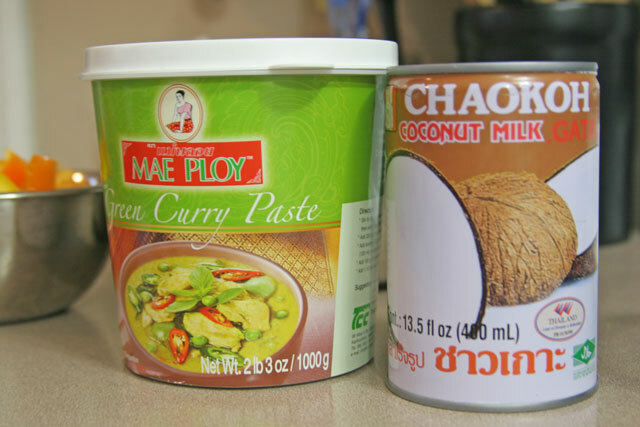 Add 1 can of coconut milk and stir well to combine with curry paste. Add 1 can coconut milk and fish sauce, stir. Taste, does it need salt? I add 1/4 teaspoon to mine. But the curry paste and fish sauce have a fair amount of salt, so taste and add salt to your liking. 2. Add the cubed pork, stir. Cover and cook over medium low heat for 30 minutes. Do not boil, coconut milk can curdle if boiled. So keep heat medium low. While pork is cooking prepare 2 cups of quinoa exactly as it says on the packaging. 3. Add the peas, eggplant and bell pepper to the curry pork mixture, stir to coat. Cook uncovered for 10 minutes. Serve curry over quinoa with a pinch of fresh chopped cilantro. I absolutely love this quick and easy take on takeout! 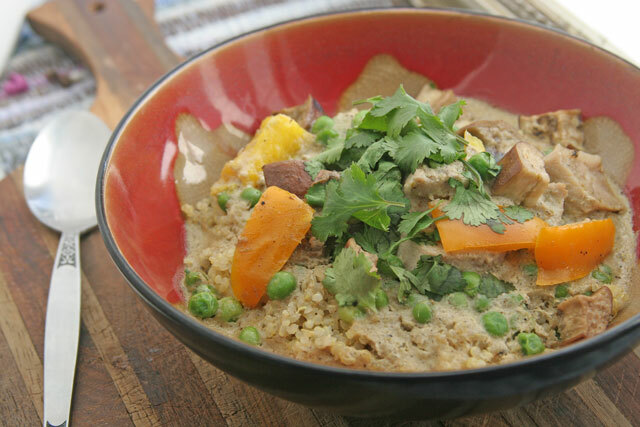 Green curry is my go-to order at my local Indian restaurant, but this is the perfect recipe to tackle the dish myself! Thank you! Me too, green curry takeout is exactly why I did this. It is easier than going to the restaurant to pick it up too. Thanks for stopping by! I personally don’t think anyone should give you flack for not using processed foods. Way to go! Thank you, Kristen! And it was so worth it. Quick, easy, and tasty.